Please note this is a 2-part class. Pattern is included in class fee. This quilt uses 1/8 yard each of eight neutral fabrics for the background and 1 yard for the border. 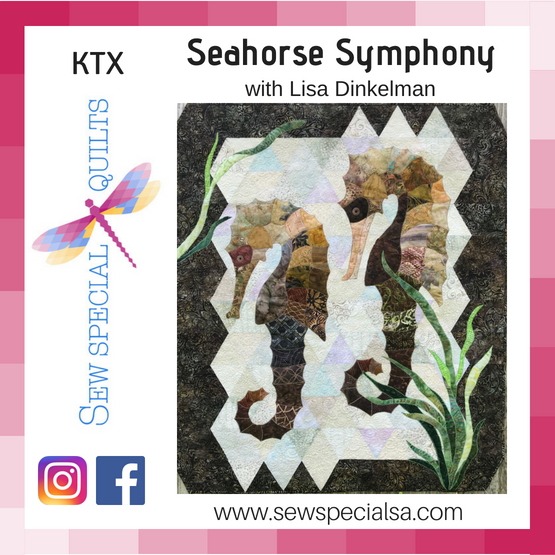 For the applique’ seahorses, you will need approx. 1 yard assorted brown scraps, as well as approx. ½ yard assorted greens for the seaweed. Additionally, you will need ½ yard binding, 1¼ yards backing, and approx. 40” x 48” batting to complete the quilt.